“My first experience of yoga was more than 20 years ago when I was a teenager, at the same time I was interested in awareness practices and lucid dreaming. I went on to spent 6 years at university and 3 years in Mexico, graduating with a Bachelor of Arts in International Studies and a Bachelor of Education, followed by a Master of Social Development (International). I returned to yoga with a passion and started teaching yoga in 2006. My enthusiasm for yin yoga and meditation was ignited when I met my teacher and mentor Sarah Powers (Insight Yoga Institute) the following year. I have attended a number of silent meditation retreats with B. Alan Wallace over the last 7 years, deepening my understanding of both Shamatha and Vipassana meditation methods. In recent years, I have been offering ‘Yin Yoga and Mindfulness Teacher Training’ courses for Yoga Teachers numerous times per year, and more recently – ‘Natural Mindfulness for Children’ courses for children’s educators to integrate mindfulness with nature pedagogy. Sarah Owen teaches Yoga and Mindfulness workshops and teacher training courses in Sydney, Australia. Her depth of knowledge and experience shine through particularly in her Yin Yoga Teacher Training courses, which have been well-received and highly-recommended by graduating students. She teaches a balanced approach to Yoga which encompasses both mindful movement as well as introspective long-held poses. Sarah also teaches meditation and awareness practices with a spirit of compassionate presence and self-inquiry. Sarah has been teaching yoga since 2006, after training at Samadhi Yoga in Sydney under the guidance of Katie Manitsas and Sue White. Her most influential teachers throughout the past decade have been Katie Manitsas (yoga teacher and author), Sarah and Ty Powers (Insight Yoga Institute), B. Alan Wallace (Santa Barbara Institute for Consciousness Studies), Maty Ezraty (senior yoga teacher) and Mary Kruger (Internal Family Systems Therapy). Sarah is a qualified primary school teacher with over 15 years’ experience including teaching yoga and mindfulness in schools. She is the creator of Natural Mindfulness for Children. The Natural Mindfulness for Children program utilizes a minimalist and naturalist approach that embraces children’s creativity and uses natural materials for printing, sculpture and hands-on play, as well as creatively engaging with the breath, the body and the Earth. Sarah continues to develop natural play-based curricula and teaching programs to educate her young son from home. Sarah is a certified Internal Family Systems (IFS) Practitioner (Level 1). She completed her Internal Family Systems (IFS) Therapy training under the guidance of Mary Kruger, through the Centre for Self-Leadership. 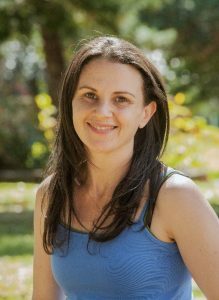 Sarah offers mentoring sessions using the Internal Family Systems model of psychotherapy at her small private practice in Sydney.